7.12.1 The parking demand is growing with growth of vehicles in the city. The multistoried buildings in busy/commercial areas are major attractors. Though the building regulations specify a minimum provision of parking area, there can be many defaulters and some who later convert the spaces for other purposes. This results in the vehicle parking spilling to streets (main road or side streets). A practical solution is to provide off street multistoried parking lots in this areas. As funds will be constraint consultants suggest a policy in this regard. The Owner who fails to provide required parking spaces as per the regulations should be charged an annual levy equivalent to market rental value for the short fall in parking area provided. Subsequently the market value will rise every year. Amount so collected plus parking charges collected will be substantially enough to meet the repayment installments of loans which were taken to construct multistoried parking lots. Once such facility is provided it is possible to prevent the on Street parking of vehicles or otherwise road space can be utilized for traffic. The development control regulations and TCP act may be suitably amended to provide for such levies. 7.12.2 Parking demand can also be controlled by implementing transport management measures like staggering office and school working hours and banning on-Street parking of private vehicles in CBD and on major arterials. However it must be realized that mere regulatory measures are not enough and positive steps are required to meet the parking demand and provide safe parking outside the congested areas. 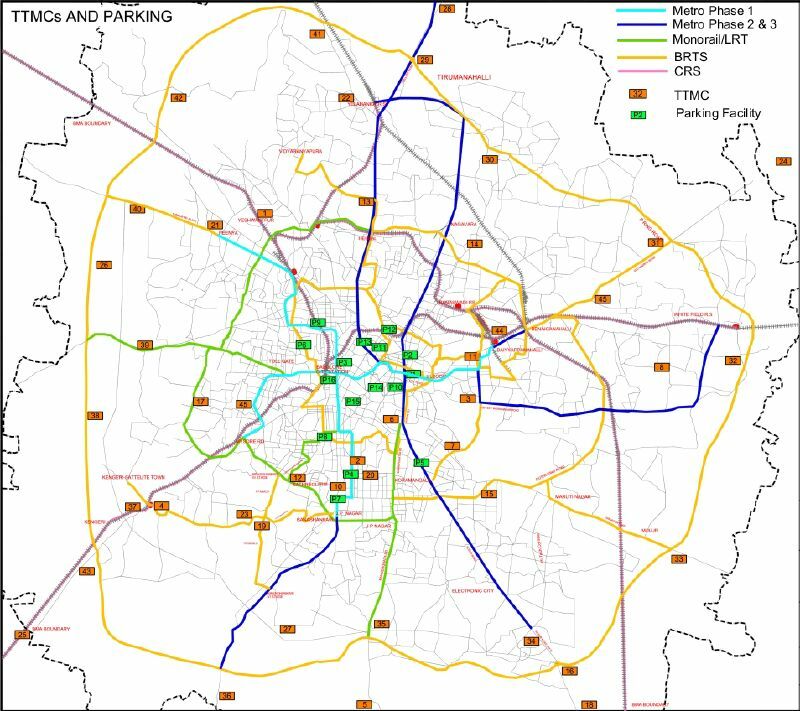 It is suggested that for proper parking management and control, to start with we may divide the city into three zones. 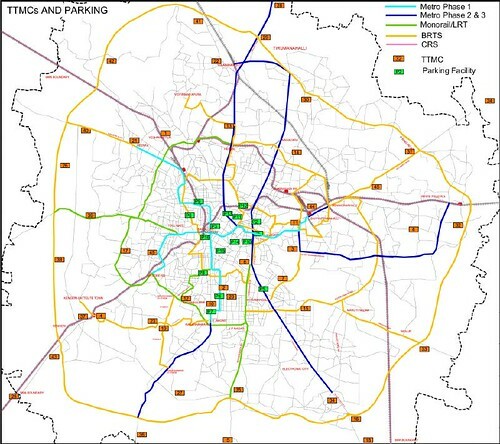 7.12.2.1 Zone A – Central areas inside the core ring road where only short term parking on hourly basis should be provided between 9 AM to 9PM with high telescopic charges increasing with every hour of parking. These areas will invariably be provided with automatic mechanical parking (AMPs). Beyond 9PM and upto 9AM they can offer lower tariff rates for long term night parking. 7.12.2.2 Zone B – between the CRR and ORR – in these areas a combination of AMPs and Conventional Multi level Parking (CMPs) can be provided at selected interchanges, especially at the TTMCs and other identified locations closer to public transport corridors. Parking in these areas will also be short term time based but at a slightly lower tariff as compared to Zone A. 7.12.2.3 Zone C – outside the ORR – large CMPs may be provided at the TTMC s and other locations adjoining the public transport stations of Metro, Monorail/LRT, BRT etc. these will be long term parking lots of 8 to 12 hour duration at a nominal tariff to encourage the vehicle owners to park at these facilities and ride the public transport system to their destination and back. following sites in Table 7.13. Of these sites, where the availability of land is limited and the land values very high, automatic mechanical parking (AMP) which can provide 500 parking lots in approx. 1000 sqm of space have been suggested. In the outer areas, conventional multistory parking (CMP) has been proposed. In addition, since most of the TTMC’s are proposed to be adequately served by Public Transport like Metro, Mono Rail/LRT, BRT etc, substantial Park and ride facilities should be provided from where the commuters can switch over from private to public transport. These proposals are indicated in Figure 7.2. Similarly at all the termini of Metro, Mono rail/LRT, BRT,CRS and their major stations out side the Core Ring Road should be provided with adequate park and ride facilities are to be provided. Within the core area where the land is scarce and very expensive, mechanical automatic & semi automatic parking may be provided with heavy time based parking Charges. In the long run, when the mass transport system is city-wide and adequate, parking demand will stabilize. Therefore it is important that adequate and convenient mass transport system as recommended above is provided.